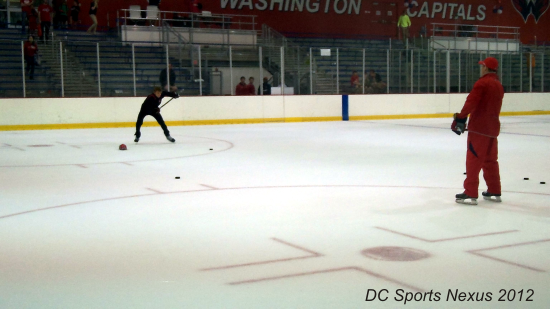 On Saturday, after the Washington Capitals wrapped up their final scrimmage of Prospect Development Camp, a young man came out to the empty ice rink with a bucket of pucks. 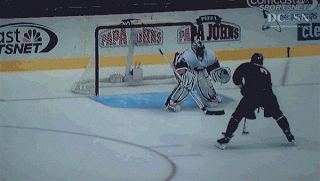 The teenager looked like he had some skills as he fired long range shots into the net. After a few minutes Adam Oates emerged from the locker room and headed out on the ice to feed the young man passes. 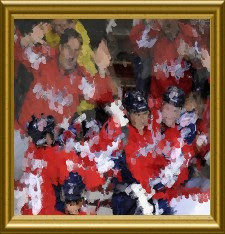 As the shooter skated past the small crowd that remained in the arena, the back of his shirt clearly read, "McPhee"; as in Graham McPhee, son of Washington Capitals General Manager George McPhee. Graham doesn't live the life of a typical kid headed into his adolescent years. How many other kids his age can brag to their friends about the time that Alexander Ovechkin gave them an atomic wedgie (video below) while they were on the ice at the 2011 Winter Classic? Graham gets to do a lot of interesting things because of his father's position. George McPhee had a seven year run in the NHL with the Rangers & Devils. His son is aspiring to follow in his footsteps. Graham was an All-Star last season in the Atlantic Youth Hockey League (AYHL), having an opportunity to play in front of several college coaches and scouts. What better way is there to improve your hockey skills than by learning directly from NHL players and coaches? On Saturday afternoon, Graham got to do just that, one of the many benefits of being the son of a professional general manager. Adam Oates joined the young McPhee on the ice and spent time feeding one-timers to the soon-to-be high school freshman, watching him and analyzing his shot. After one-timers came catching passes and firing wrist shots, a session where Oates got on the young man for a bad leg kicking habit that he had developed. The practice session was only about twenty minutes long, but those minutes were probably very helpful to a young man who aspires to play hockey in college and possibly beyond. Shooting with a former 10-time NHL top 20 scorer isn't a bad way for a kid to spend a Saturday afternoon. And perhaps one day, young Graham will find himself on the ice during a scrimmage, playing in development camp for his father's hockey team.